Getting the word out to potential buyers is one of the most important aspects of conducting a successful auction. This can be done using several marketing tools. So how do we advertise your auction to provide you the best results? The goal is clear. As a seller, the most important consideration is the "bottom-line." You will get the most proceeds from your auction if you maximize the crowd -- the right crowd. Our multi-dimensional marketing system gets the attention of the people you will want at your auction. 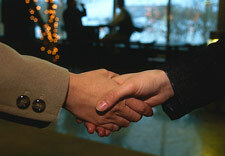 With the right people there, you are assured fair market prices. Here's what we've discovered. To sell select residential and commercial real estate we proactively target and engage potential qualified buyers. At Florabama Auction Services, we believe each seller deserves personalized service tailored to their property and their personal expectations. We find buyers using a customized marketing program that exclusively promotes your property at auction, as an important real estate event. The auction event creates the sense of urgency that is needed to sell the property on or before auction day. Many sellers of real estate are frustrated with the lack of activity, and the length of time their property has languished on the market. Many times, the traditional method of selling a property is just not working. At this level, a property needs much more than a listing in the local Multiple Listing Service (MLS), a sign in the front yard, and maybe an ad or two shared with the agent’s other listings. This approach is simply not providing the service and results a seller of luxury real estate wants or deserves. The key to success is to differentiate your property from all of the other properties currently on the market, and to present your property to qualified buyers of this type of real estate. A buyer of a multi-million dollar property has many choices, and money is usually never the determining factor in the purchase. We study your property, and do extensive research on other properties for sale in the area to determine your property’s competitive advantages. Our professionals then create marketing materials that feature your property exclusively and showcase all of its features and benefits. By marketing your property for sale at auction, your property instantly becomes distinct from all other listings. While the auction method is becoming a more popular way to sell real estate, it is rare for two properties to be for sale at auction in the same market at the same time. 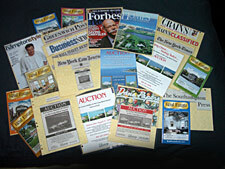 Florabama Auction Services’ accelerated marketing program reaches qualified buyers using a combination of methods that may range from advertisements in national, international, regional, and select local publications to direct mail brochures and invitations to preview the property and attend the auction. Since each property is unique, placement and choices will vary depending on the property. It is critical to be specific in targeting potential buyers. Many real estate firms or auction companies will sell the benefits of their huge database of buyers. It is not enough for a company to have a large list. It has to be the right list for your property or it is useless. There is no benefit of sending a brochure or auction information package to someone that would never be a prospect for your property. 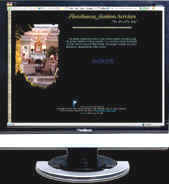 At Florabama Auction Services we are more selective with our marketing. Our professionals consult with the seller and other professionals to determine the characteristics of the most likely buyer. We then create a custom master list that includes potential buyers in specific professions, income levels, net worth, zip codes or geographic regions, and other appropriate criteria. Our targeted and compelling invitation brings qualified and motivated buyers to see your property and bid. The goal is to sell your property at the highest possible price in the time frame that you desire. We work to give your property the exposure it deserves. The marketing is designed to entice interested parties to attend the property preview period. Our staff works at the preview to encourage interested parties to bid at the auction, and compete for the right to own your property. We create a true “marketplace” and a forum for deal-making. We manage a real estate event that brings multiple seriously interested buyers for your property together in one room at one time on the same day. With an auction the price is bid UP, not negotiated DOWN like in a traditional real estate transaction. In the end, our seller’s hear the words they have waited for….SOLD!!!!! Our goal is to maximize the number of bidders, and to sell your property at the highest price. 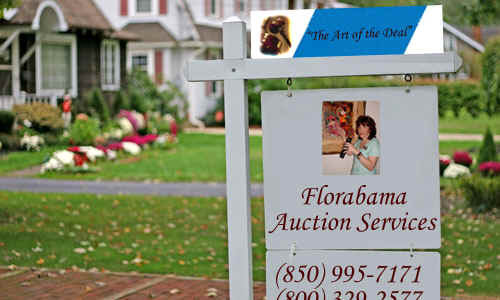 Florabama Auction Services has put together an extensive database of potential buyers. Along with this database, we enlist the help of a market specialist to determine other areas of interest. The market specialist will take in to consideration the location, style, and value of your property and target other specific buyers across the country. From this compiled list of potential buyers, each will receive one of our gorgeous custom brochures and an invitation to preview your property and attend the auction. Florabama Auction Services will design a full color brochure with the interests of your property’s potential buyers in mind. Our goal is to provide potential buyers a visual impression of your property while simultaneously educating them on the market area and auction process. We begin the design process by utilizing the services of a professional photographer to capture the uniqueness and beauty of your property and its location. Then our state-of-the-art graphics team use those photographs to show potential buyers what the property has to offer and how they can benefit from purchasing the property. Our brochures are designed to leave a lasting impression and to move potential buyers to the next stage of preview. One of the best methods of reaching the most people at any given moment of any given day is the Internet. To prove the point, ...where are you right now? Exactly...on the Internet. You along with millions of other people around the globe use the Internet to conduct research, purchase and sell items, correspond with friends and family across the globe, etc.. In the world today, the most important marketing tool is no longer the newspaper. The newspaper has been superceded by the Internet and other technologies that have radically changed auction marketing strategies. New buyers are looking for properties every day via the Internet. Our professionally designed website has all the information they need to view your property. Your property will have its own link to a beautifully designed web page showing the user a detailed view of your property. They will also be provided contact information as well as the time and date of the auction, photographs, along with maps and driving directions and weather outlooks. Your property will be listed in major search engines and will be easily found using the appropriate key words. For example, a potential buyer searching in Yahoo for “luxury home for auction,” will find your property at or near the top of this search result. We have the experience to ensure that your property is found on the Internet using as many key words as are appropriate. There are certainly situations where a newspaper advertisement is prudent, or possibly even legally required. We will advise you on the cost and proper placement of ads, and produce quality camera-ready advertising, if possible, to ensure accuracy. A media schedule is designed exclusively for your property. This will include a presence in national, regional and local publications, and international where appropriate. We advertise in major publications such as the Wall Street Journal, New York Times, USA Today, New York Daily News, Variety, DuPont Registry of Fine Homes, Commercial Property News, and Crain’s Business Magazine. Our Media Coordinator is working to make sure that our ads are effective and highly visible in every publication. It is equally important for our potential buyers to find your property easily. Directional signs are placed in highly visible locations directing buyers to your property from all areas of your market. These signs can be designed specifically for your property and include property features, preview schedule, date of auction, website, and telephone number. Our auction signs are designed to identify your property for auction. This sign is generally installed 30 to 45 days before your auction. An information box may be installed on selected signs which will give buyers the opportunity to acquire a brochure that did not receive one by mail. The property preview virtually eliminates the in-convenience of last minute and unscheduled showings. We schedule a 3 to 5 day preview period immediately before the auction date. Florabama Auction Services has a professional auction staff on-site during the preview to give buyers the opportunity to tour your property and answer any questions. This preview period gives our staff the opportunity to meet your potential buyers and qualify them before auction day. We make sure the auction process is explained to each potential buyer and is given the information to become a registered bidder during this period.